With the latest update we made Fluxiom more Finger friendly. Many customers use the iPad on a daily basis so we wanted to improve the experience. Share large files like videos or images on the go or download a PDF right to iBooks, no problem! 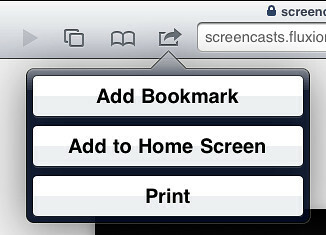 Smooth scrolling: Thanks to iOS5 we improved the asset view and made browsing files fast and super-smooth. Give it a try! Toggle select: If you’re on a PC/Mac we’re sure you love the rubberband select and all the desktop like features Fluxiom offers to select files. For the iPad we added a toggle select so you can select multiple individual files. Tap a file to select it, just tab again to deselect. For quick access add Fluxiom to your Home Screen. Open Fluxiom in Safari and tap the Go To icon next to the URL. Tap Add to Home Screen. We hope you find the new updates helpful. If you have any questions please don’t hesitate to contact us. We have rolled out an update that fixes an issue with the Remember Me functionality. The old “Remember me” function was not working properly and caused troubles for some of you, and we really regret that. So we put some time aside to not just quickly fix this issue but overhaul the whole process. 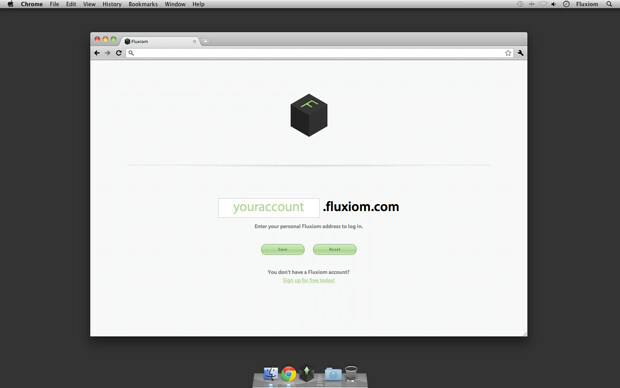 When signing in to Fluxiom, you are given the option to click Remember me on this computer, so the next time you open your browser and visit Fluxiom, you are not required to sign in again. As long as you don’t explicitly sign out, Fluxiom will remember your browser. 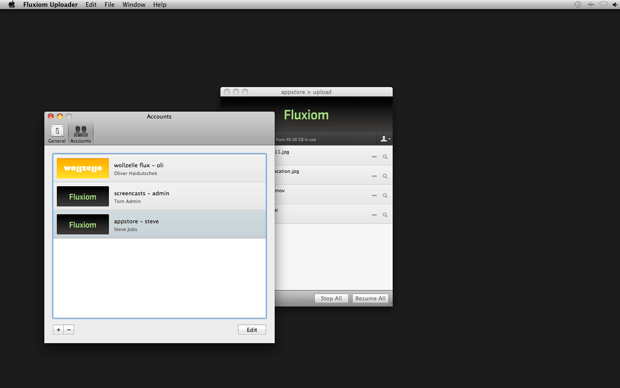 Fluxiom can also keep you logged in on different machines at the same time. Logging out on one machine will not log you out on any other computer or mobile device where you previously logged in with “Remember me” checked. The “Remember me” functionality is a great option for your personal computers or your mobile devices. However if you are using a publicly-accessible computer we recommend to not use the “Rembember me” functionality or at least make sure that you click “Sign out” before you leave the computer. We also added additional security updates and included SSL encryption for the Login page for all accounts. While full SSL encryption is included in all Pro-and-higher plans we have added SSL secure encryption for the Login page for all Fluxiom accounts, including the Free accounts. We hope this improvements make it more convenient for you to access Fluxiom from your different devices be it your laptop, iPad or your office machine. We just launched an update to the Fluxiom API that brings some big performance improvements, making response times significantly faster. As part of these improvements, we introduced pagination for assets. Now assets are returned in batches (‘pages’) instead of all at once, and the number of items per page is configurable so you get back only what you need. There are numerous other goodies, including JSONP support and asset counts for tags. For full details please refer to the API docs to see what’s new, and if the changes affect your app. As always, if you have any issues with the API please let us know. Ok, we are, admittedly, just kidding. 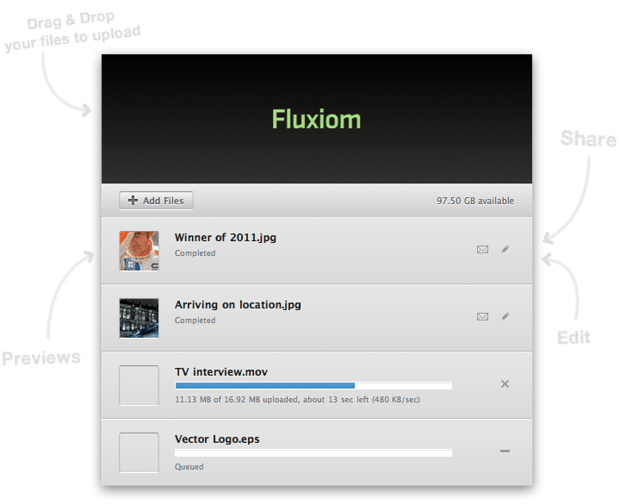 Still, we have been hard at work to renew the entire file upload interface in Fluxiom. 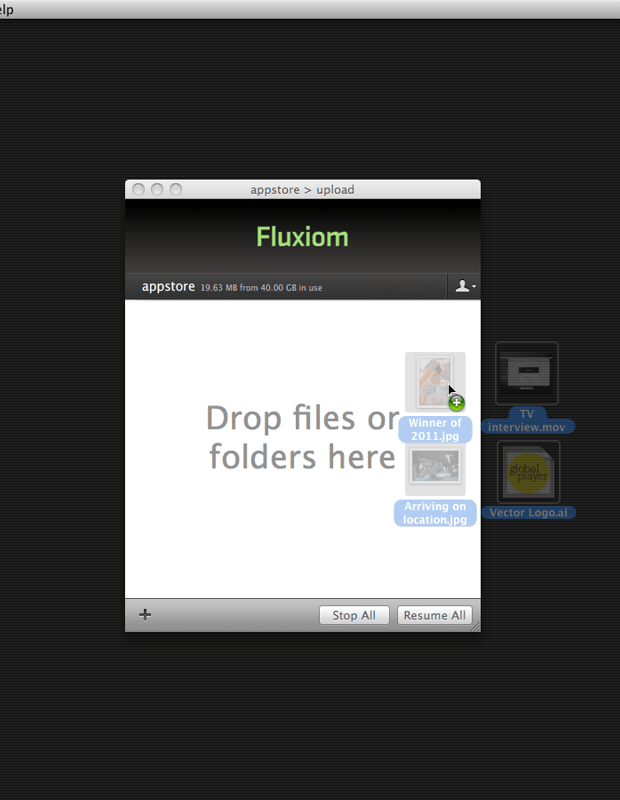 Built from scratch we included features previously reserved for the native Fluxiom Uploader App. The new interface provides a seamless upload experience from the desktop to your Fluxiom account, including multiple uploads, drag and drop support, live previews, one-click sharing and editing. With the new interface it is a snap to upload multiple files in a single go or add files to the queue once your upload is already in progress. And yes, it also supports drag and drop. Common actions like preview, share or edit are available for each file so you can immediately take action. Drag-and-drop support makes uploading files as convenient as moving them around on your computer. The whole upload window acts as a large drop target for immediate and fluid action: small menus and upload forms are a thing of the past. Slicing the files allows the uploader to recover from errors by picking up an upload where it left off, thereby using dramatically less time and bandwidth. This feature is currently supported in Firefox 4+ and Chrome. Preview, edit and sharing is just one click away. The new uploader has already gone live and is available in your account by the time you read these lines. We encourage you to give it a try without delay and look forward to hearing your thoughts. And remember, we are always here for you should you encounter any difficulties whatsoever. deployment and automatic updates across all your machines. uploads with unshakable stability when dealing with voluminous files. of course, makes it a snap to use the uploader at work or play. so that you can focus on your main work, not the uploads. If you are holding out for Lion and are not yet rocking Mac OS X v. 10.6.6+, please know we are still supporting our original fluxUp! application and will continue to do so for the weeks to come. The main window has been redesigned with crisp progress indicators and one-click access to the most-frequently used file-related actions: add, remove, preview, pause and resume. And if you count design as a feature, like we do, notice we are rocking a new logo to celebrate Fluxiom’s 5th anniversary. 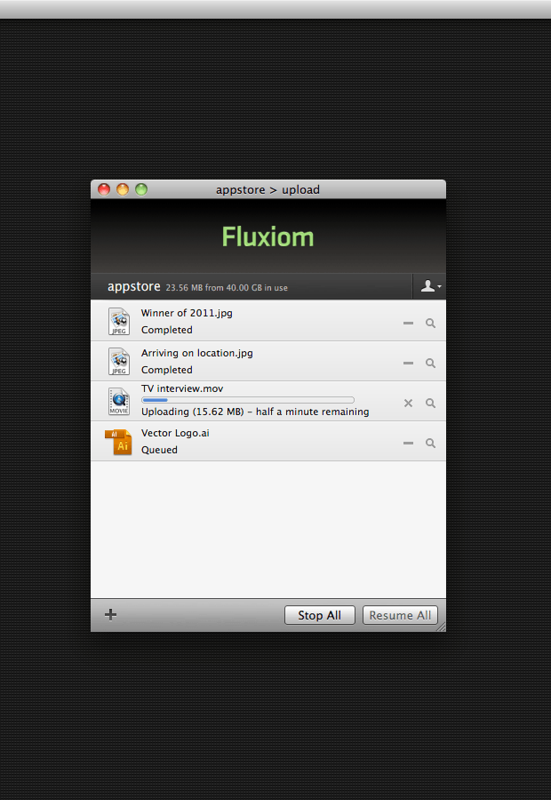 Get Fluxiom Uploader from the Mac App Store with your usual Apple ID credentials. It’s free, as always. We hope you like it as much as we do, and encourage you to contact us with any questions. Five years ago, to the day, Fluxiom was born out of a desire to share photos and mock-ups with our clients. It was an experiment in Web 2.0 before it became a buzzword, and it pushed the boundaries of what a site could do by bringing a desktop-like interface to the browser. Thanks to your loyal and enthusiastic support, Fluxiom has grown beyond all our expectations. You have shown us the way to more and better features, demonstrated über-cool uses of your very own, from business to the arts, and kept us on the edge of our seats by expecting nothing but the best, which we strive to deliver and hope we have. We will soon have announcements for you as the next generation of Fluxiom is banging on the door, asking to be released from the lab. But today is about celebrating the community that made it possible and turned an experiment into a solid and successful service. Please join us in some Fluxiom cakes and the green drink of your choice. And here is to the next five years at the side of our terrific users! For companies large and small, the move to the cloud is underway, and in a big way. Jolicloud and Chrome OS have made the no-fuss, no-risk computer a reality, allowing users to work from any location, safe in the knowledge their data is immediately flown to dedicated, well-protected servers in a cosy data centre. There is no need to open new accounts or go through complicated setup procedures. 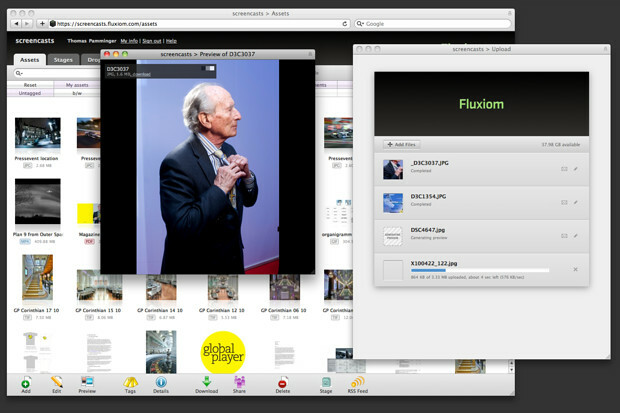 Simply log into your usual Google account and go to the Fluxiom page on the Chrome Web Store. From there, installing the application is a matter of a single click. Fluxiom will now appear right in your « New Tab » page. 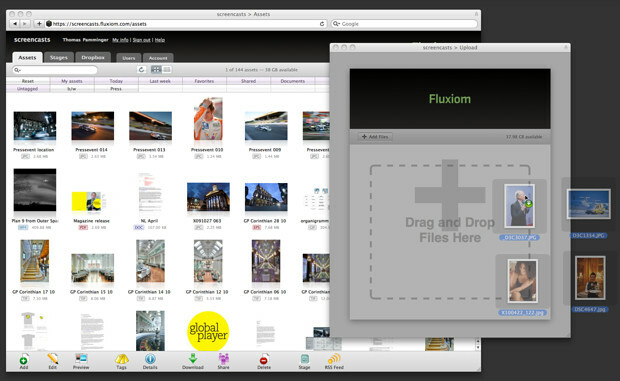 Amongst the benefits of tighter integration between Fluxiom and Chrome is an über-cool full screen mode, that transforms your laptop into a turbocharged digital light box to edit, share and organise media files. If you don’t use Google Chrome, do give it a spin. 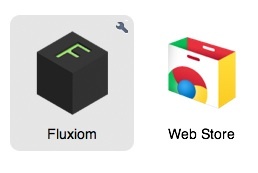 But don’t worry, the Chrome Web Store is only one of many ways to access Fluxiom, including your existing standards-compliant browser, no matter what it may be. Our engineers are dedicated to making Fluxiom as stable and fluid as the Web allows, and this is only one of the many avenues we are working on. We look forward to hearing about the wonderful ways in which you Flux’ on the road! Fluxiom will be unavailable for around 60 minutes on Sunday, February 6, 2011, 9:15am GMT (view in your timezone) for system maintenance. Thanks for your patience while we continue to improve fluxiom for you. Be the first to read about updates, announcements and system status over at our twitter stream. Update, February 6: Fluxiom is up and running again. Thanks for your patience! 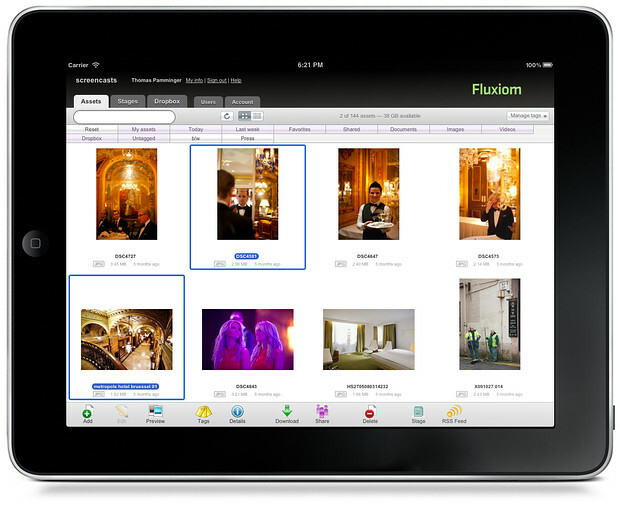 An ever-increasing number of Fluxiom users are accessing their account from an iPad or an iPhone. In fact, their portability and always-on Internet access truly unleash the power of Fluxiom, by turning any account into an instant portfolio and reference library. We are delighted to confirm that the iPad and iPhone are indeed supported by Fluxiom, and that all the main features of your account will work within Mobile Safari, the built-in browser. In fact, such has been the case since the iPad first came to market! Furthermore, we are hard at work developing and testing additional enhancements to the service that will further optimise the interface on mobile and touch-driven devices. We will be sure to keep you posted as we have more to announce in that area. Should you have any questions or comments about using Fluxiom on your iPad or iPhone, please feel free to contact our support team, who will be delighted to help.